Wyatt Lee Linford Hite, son of Samuel Tobe Hite and Nancy Ann Summey, husband of Mirinda Adeline Vaughn. Mary Adeline Vaughn, daughter of Hart Vaughn and Maryanne Tidwell, wife of Wyatt Lee Linford Hite. Lee Linford Hite, age 65, of Canton Route 2, passed away at a Canton hospital at 1 p.m. March 15. 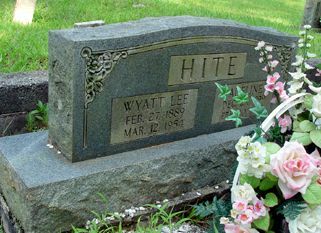 Mr. Hite, a retired farmer, had lived near Canton 19 years. He was born in Bartow County on February 27, 1889, the son of Mr. and Mrs. Sam Hite. He was a member of the Refuge Baptist church. Survivors include his wife, Mrs. Adeline Hite, and mother; one son, Robert Hite, of Whitesburg; three daughters, Mrs. John Rampley, Mrs. Willie Rampley and Mrs. Hoyt Waters, all of Canton; one brother, Henry Hite, of Whitesburg; and five sisters, Mrs. John Smith, of Cartersville, Mrs. July Hibberts, of Fairmount, Mrs. Rube Pruitt, of Carrollton, Mrs. Lee Rampley and Mrs. Henry Rampley of Canton. Funeral services were held at Refuge Baptist Church at 2 p.m. March 14, with the Rev. Will Darby officiating. Interment was at Macedonia Church Cemetery in Bartow County, with the Baker Funeral Home in charge. 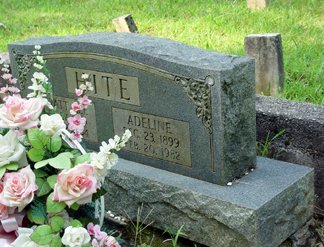 Mrs. Merinda Adeline Hite, 82, Waleska, died at her home after an extended illness. Funeral services were held February 22 with the Rev. Will Darby, Raymond Brown and Earl Nelson officiating from the chapel of Sosebee Funeral Home. The Melody Girls sang selected hymns. Interment followed in the Old Macedonia Cemetery. Surviving are her daughters, Mrs. Agnes Rampley of Canton, Mrs. Eva Rampley of Whitesbury, Mrs. Orlean Waters of Waleska; son Robert Hite of Carrollton; sisters Mrs. Viola Simpson and Mrs. Pollie Starnes of Cartersville; 15 grandchildren and 49 great-grandchildren.